Turmeric Braised Chicken with Golden Beets and Leeks is a flavorful dish layered with vegetables and spices, covered with wine and baked in a casserole dish. What emerges from the oven once it’s done is the most incredible tasting chicken dish in a rich, golden broth with the perfect balance of flavors that will make you want to lick the bottom of the dish, it’s THAT good! 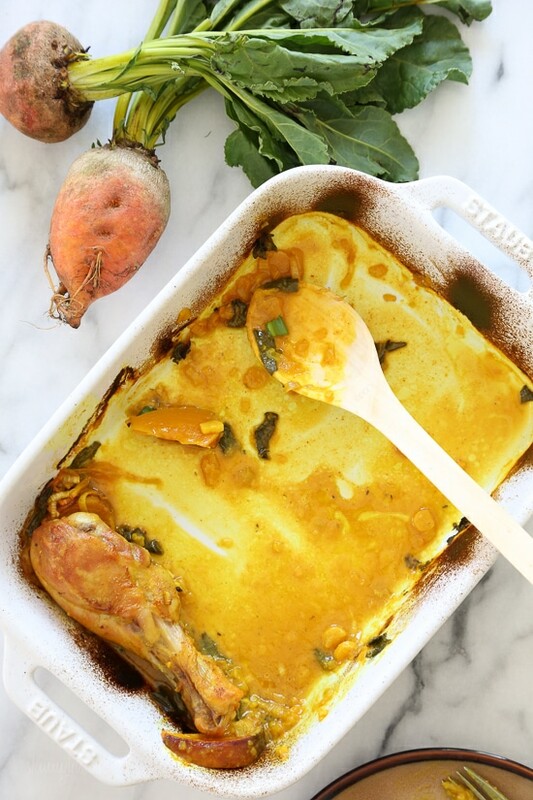 Golden beets, turmeric – I just love the colors in this dish! And the flavors were balanced and so flavorful, I made this two nights in a row! This dish is from Phoebe Lapine, book author of the Wellness Project, a book that chronicles her journey to heal her autoimmune disease (Hashimoto’s thyroiditis) while finding a balance to make a series of lifestyle changes. 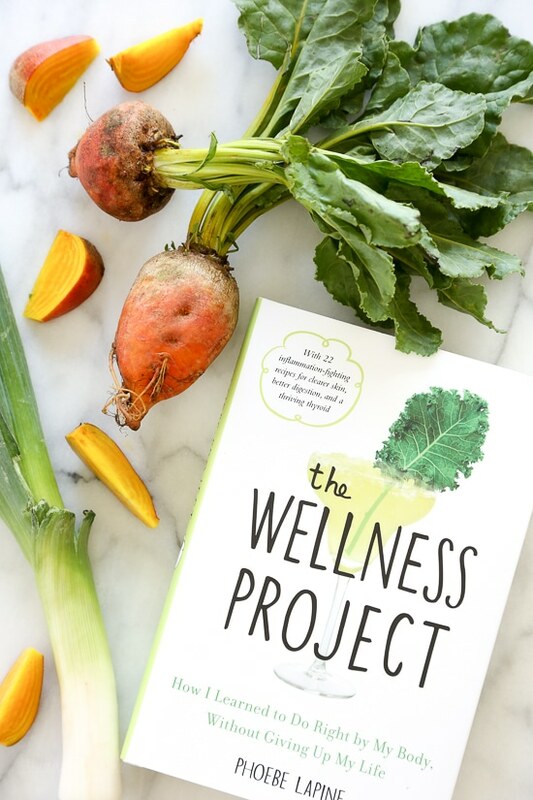 Her book has practical advice on fitness, sleep, relaxation, hormones, as well as cooking advice with 22 inflammation-fighting recipes for better digestion, clearer skin and a thriving thyroid, including this one. I enjoyed this recipe as is, but if you want to swap the beets for another vegetable, I think potatoes would also work great. You can easily modify this to be Whole30 by swapping the wine for chicken broth. 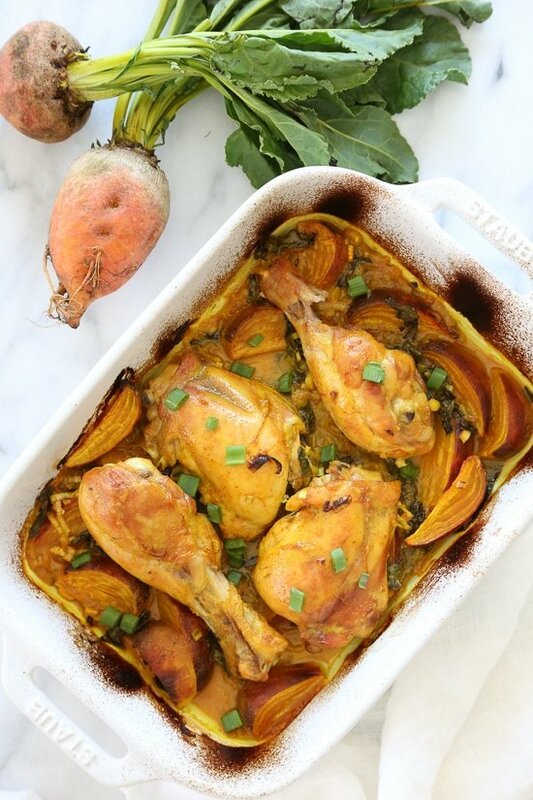 Turmeric Braised Chicken with Golden Beets and Leeks is layered with spices, covered with wine and baked in a casserole dish. Slice the leeks in half lengthwise. Rinse them, fanning out the outer layers to wash away any grit. Slice the cleaned leeks into thin half-moons. 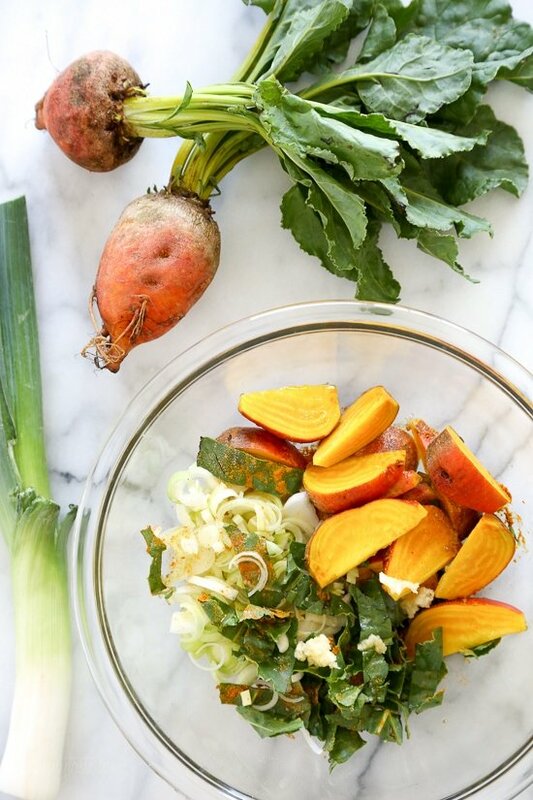 In a large mixing bowl, toss the leeks, beets, and beet greens together with the garlic, 1 teaspoon of turmeric, ginger, salt, lemon juice, and olive oil until thoroughly combined. 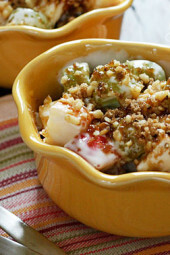 Spoon the mixture into a 9 x 13-inch baking dish or casserole pan and arrange in an even layer. Add the chicken and the other teaspoon of turmeric to the mixing bowl and toss to coat in the remaining turmeric mixture. Transfer the chicken legs to the baking dish and nestle in the beet mixture. Drizzle any of the remaining marinade over the top of the chicken and pour the wine around the sides of the dish. Roast, uncovered, until the chicken is fork-tender and the beets are soft, about 1 hour. Trying the Keto diet and I love this recipe so I made this low carb by substituting the beets with cauliflower and substituted the greens with spinach. It was delicious and very low carb! We absolutely loved this! Aldi didn’t have any beets, so we used potatoes and were very happy with the results. I’m anxious to try it with beets though. Do you have any recommendations on how to cook this in an Instant Pot? Totally substituted lime juice for lemon as I didn’t have any and it was still AMAZING. Saw on Facebook someone made this and it reminded me I have been wanting to do it. We loved it and it will be a regular. So much interesting flavor from the ingredients. Leeks really shine through and the golden beets are so pretty. The lemon gives it brightness . I can’t decide what the flavor is of turmeric when I add it to things but I know it is good for you! This one looks so pretty too. 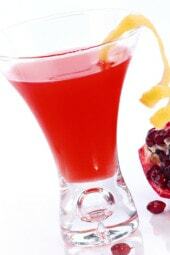 Great inventive recipe with wonderful flavors. This was incredible! Clean up was so easy since everything could be mixed in the same bowl and cooked in the same dish! Since I cook for one, I only used 4 thighs, but used the same amount of veggies. I found that that easily made four meals for me!Looked forward to lunch every day! 🙂 Thank you! Used potatoes and broth bec that’s what we had. Other veggies subbed. Flavors come together wonderfully! Another hit at our house! Thank you Gina! This was soooo delicious! Used red beets, which made a beautiful red sauce. Beets didn’t have many greens attached so I added spinach. Used 6 thighs, no legs. Served it over rice. Thank you for another great recipe!! I’m trying to watch my acid intake for health reasons. Do you suggest anything in place of lemon juice? Absolutely wonderful!! I will definitely make this meal again. Thank you for another favorable and simple weeknight meal! I made this recently with parsnips, tomatoes, onions, and fresh ginger. It was great. Parsnips aren’t as sweet as beets so I used half the lemon juice. Thanks Gina! Made this tonight and it was gorgeous. I love all of your recipes and so does my family!! Thank you thank you thank you! Do you think I could make this the night before and then put it in the oven he next day? This recipe was simply amazing!!! Will make again. Made this tonight for a family of 6. Four teenagers – 3 tried the beets, with 1 liking them. It’s a keeper for the hubs and I. Served with jasmine rice. Thank you for another awesome recipe! This was delicious! I followed the recipe to the letter. I removed the stems from the greens before chopping. Can’t wait to add this to our rotation. A lot of times my grocer store takes the greens off the beets. What and how much of could I use in their place? Any dark leafy green would work, I would guess 3-4 cups. Gina, as I can only have one half of a chicken breast (cut in half horizontally), would you suggest that I put everything else in the oven for about 30 minutes and then add the chicken or would you suggest a different cooking time? Yes otherwise you will overcook the chicken. Keep in mind the flavor of the dish will be different with the breast. This looks great but I don’t think the nutritional values could be correct. It says there is only 2 grams of fat but a chicken thigh and leg contain at least 22 grams of fat plus you added some olive oil. This dish would be great for my client. I am putting this dish on their next menu. Thank you! This was a delicious and interesting way to use my CSA veggies. I had both golden and red beets, so I popped them all in. I chose to use 6 boneless skinless thighs instead of the combination of bone-in thighs and legs because who wants to mess with all the bones? That made 3 nice servings with plenty of veggies (which were truly scrumptious!). Make sure you cut the beets small enough so that they will cook in an hour….I tried for about 1″ cubes and that seemed to work pretty well. I also salted the chicken before popping it on top of the veggies. (And a little more white wine is never a bad thing!) The beet greens provide a nice, slightly bitter contrast to the leeks and beets. It’s a wonderful dish! Served it up with a big side salad (more CSA) and we had plenty. Good dish and healthy. It maybe needed a little more salt or something? I even salted the chicken lightly, but I just didn’t find it crazy flavorful like others. The chicken was incredibly crisp and beautiful on top though. This was really good. I used low sodium chicken broth instead of wine and since my beet greens weren’t very fresh I used a mix of Swiss chard and spinach instead. Just made this for dinner last night. It was really tasty! I had to make a little extra marinade for the greens and chicken though and cook in two casserole dishes so the beets would get roasted rather then steamed. Looking forward to eating the left overs for dinner tonight! Thank you for sharing this delicious and healthy recipe. Hardly to find recipe with turmeric so this is great. Turmeric is indeed very good and healthy for our body. I’m absolutely will try this for my family. What if you are not a leek fan? Is there any alternative I can use? Sounds delciious but macros seem off. How does this have 2 gm of fat for 1 thigh and 1 drumstick? This was my first thought too. I’m just going to upload the ingredients to MFP myself. OMG good! Made this last week with red beets and the entire family loved it. I was nervous as I have never cooked with turmeric or beet greens and couldn’t have been happier with the results. Probably one of the prettier dishes I’ve ever served…in fact, the hub said it looked just like plate at a fancy restaurant. Definitely joining the rest of your recipes in our regular line up! This is such a great recipe. My family enjoyed it so much, I’m making it tonite for a second time. Thank you for sharing Gina! Please keep them coming! What would you serve this with? e.g. rice, farrow, etc. I was wondering the same thing. Have you gotten any suggestions or tried anything? Gina, it was delicious! And nobody could guess which veggies were there;) Thank you! I made this for dinner tonight. You were not kidding about how delicious this was!!! I loved it and it will go in with my favorite recipes. I couldn’t find the golden beets with tops on them, so I substituted Swiss chard. Really yummy. Thanks for another excellent dinner. I made this last night and of course missed my exit for the store that actually has golden beets and didn’t think that red beets would work so I used potatoes. WOW!!! This was FANTASTIC!! I used chicken broth instead of the wine and left out the greens since I didn’t have the beets then realized I could’ve just bought a package of collards and used those but oh well. It was absolutely delish and can’t wait to make it again with the beets. Next time I see golden beets, I am buying them and making this recipe. Another winner!! Gina – would this work in the crock pot? I’d love to make this during the week! I made it in the crock pot yesterday! I didn’t love it as much as the oven version, but I’m contributing that to the fact that I used skinless boneless breasts since that’s what I had! My husband was helping me prep the beets when I expressed my concerns about this recipe. I told him I’m just going on “blind faith” because I really wasn’t sure how this was going to come together. He said, it’s really not “blind” because you’ve loved Gina’s recipes and he trusts my instincts. What a guy! And what a winner this recipe is! I could only find red beets but the beet greens were beautiful. I used all thighs and I was generous with the dry white wine I used. One thigh was enough of a serving for us. Everything was cooked in about an hour. The flavors are really unusual. I don’t think most people would guess the ingredients. Thanks for a beautiful and satisfying plate, Gina. I’m so happy you enjoyed it as much as I did! I just made this for dinner, and it was absolutely delicious!! I used 2 bone-in chicken breasts (skin removed) and simply turned them over half way through cooking to keep them from drying out. The plan was to save some of the vegetables for lunch tomorrow, but they were so good we ate all of them! Can this be made with boneless thighs? If so, what’s recommended oven temp and cook time for that? Could only find beets without greens. Can I add kale or spinach? I’m thinking I’ll add the 2nd tsp of turmeric when putting the chicken in the marinade, because I can’t find where to add it in the recipe either. Thank you for sharing! 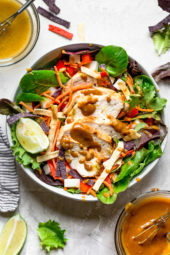 Made this for this week’s meal prep (with chicken broth as an alternative like you suggested) and it’s so delicious – especially reheated the next day because the spices and flavors really soak into the chicken. Do you peel the beets first? So, you eat the peel? Or peel after cooking? I’ve never heard of not peeling beets, so just making sure..
Any ideas on adapting this to an Instant Pot Pressure Cooker? I usually use Pinot Grigio or Sauvignon Blanc. Looks so yummy! If I could only find golden beets! On my way home from work tonight, I stopped by WalMart Neighborhood Market, which has an amazing produce department, and to my delight, they had gorgeous golden beets with the lovely, fresh greens still attached! Great price, too! If only I’d remembered leeks. I’ll get some tomorrow and make this dish for Friday night supper! Like Pam, I’m wondering about the 2nd teaspoon of Turmeric. Once you’ve put the vegs in the casserole and then you put the chicken in the bowl, which I assume has some of the “sauce” still in it, do you add the 2nd teaspoon of Turmeric to that? And then toss? Also, I notice your photo shows half the amount of chicken. I assume you halved all the other ingredients, too, including the beets and leeks. Since I just cook for one, I would probably halve the recipe, too. How are leftovers reheated? OK, I hope? I’m eager to try this! What do you do with the second teaspoon of tumeric? I am not seeing anything in the directions to say. Thanks for asking this. I had the same question. Hiya, step 4. has the first teaspoon with the veggies, spices, and lemon jce/EVOO. Step 5. has the second teaspoon combined with whatever is still left in the bowl and the chicken. I made this last night for my family of four and we LOVED it! No golden beets at our grocery store, so had to use traditional red. The flavors of the beet greens, leeks and beets sprinkled with the turmeric, garlic and ginger was fresh and unique. Thanks for another delicious and healthy recipe. Keep ’em coming!! Would bone-in skinless chicken breasts lower the calorie amount? Also, would it change the cooking time? Would LOVE to make this but not a fan of thighs and prefer chicken breasts. We don’t like dark chicken either and are using boneless chicken breasts. To keep it from drying out I drizzled a little olive oil over the breasts about halfway through the baking time. Will let you know how it tastes. The aroma is incredible!